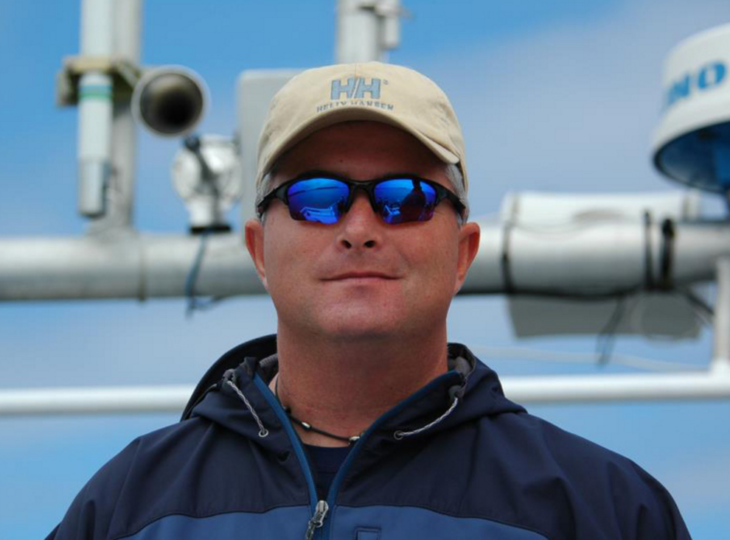 Headed out to the vast and wild Atlantic Ocean, Captain Wayne got to the open sea where the swelling waves were teetering on the edge of extreme adventure. Just outside Bay Bulls sheltered harbour, the wind was high and whitecaps were everywhere. Worried that his precious cargo, six passengers aboard, may get soaked to the bone with salty-sea waves, he opted for calmer seas. He decided to turn around and head for home. Moans of “oh no”, disappointment and sadness came from the crowd onboard, knowing they wouldn’t see a whale today if they turned around and went back in. 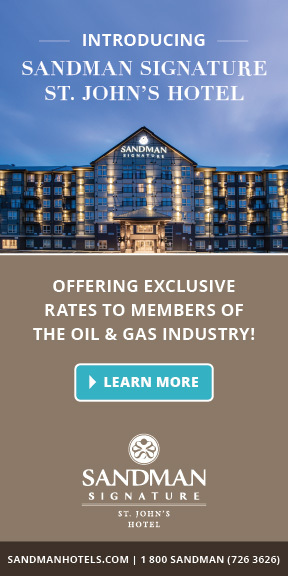 But like all great things in this province of Newfoundland and Labrador, they come with a stubborn determination that opens up the doors to great treasures on the other side. Bold as brass, everyone affirmed that venturing the great waves and possibly seeing a whale was better than nothing at all. In fact, it was a welcomed wild adventure. With all the guts and glory of true seamen, we about-faced and ventured headlong into the waves. Forward she goes, Captain Wayne’s boat bobbed and listed on the water’s surface just like a cork floating in the water. Dips and valleys, splashes and screams of salty surprise, we held on for the ride and crossed the choppy waters to the bird island ahead. 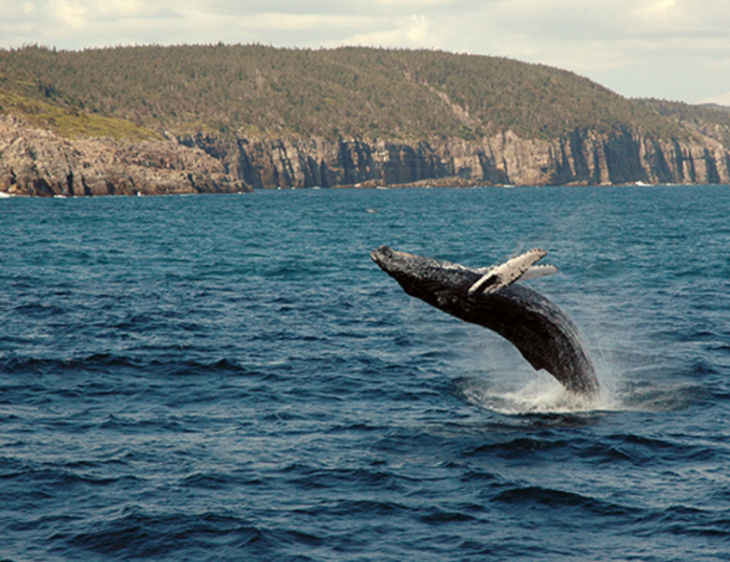 There are 22 species of whales that come to feed, play and frolic here. The types of whales include the minke, sperm, pothead, blue, orca, and the world’s largest population of humpbacks visit us off the coast of Newfoundland. 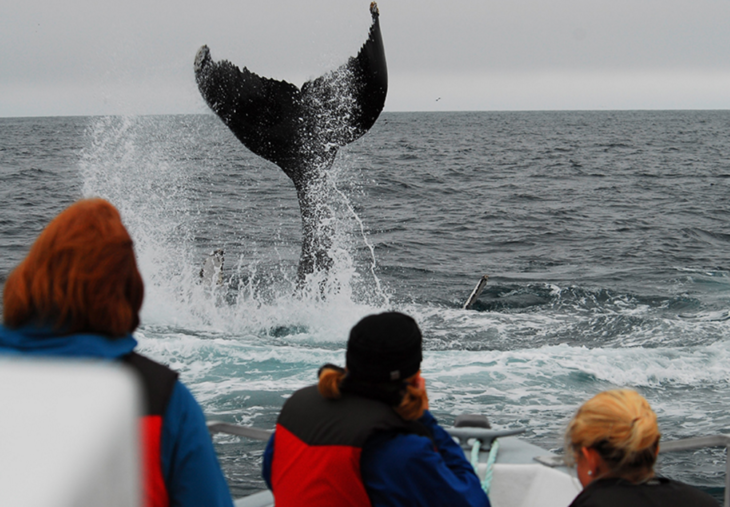 The whales feed on capelin, krill, and squid from the months of May until September. July and August are peak whale watching times. Whale watching can happen from shore but the ultimate whale watching experience happens in small boats that get up close and personal with these peaceful giants. Now that’s a Whale of a Tale! Travelling up from the Caribbean Humpback Whales are a sight to behold off the majestic cliffs of Newfoundland. Embarking on a feeding smorgasbord, these whales dance in delight as they move through the waters of the Atlantic, off this coast. When their bellies are full you’ll see the humpbacks breach out of the ocean just like a castle reaching for the sky. Then they will plunge back down into the ocean with a mighty crash, splashing waves at each other and enjoying the bubbly sunny days of summer. All you have to do is look at them to know that they are happy. 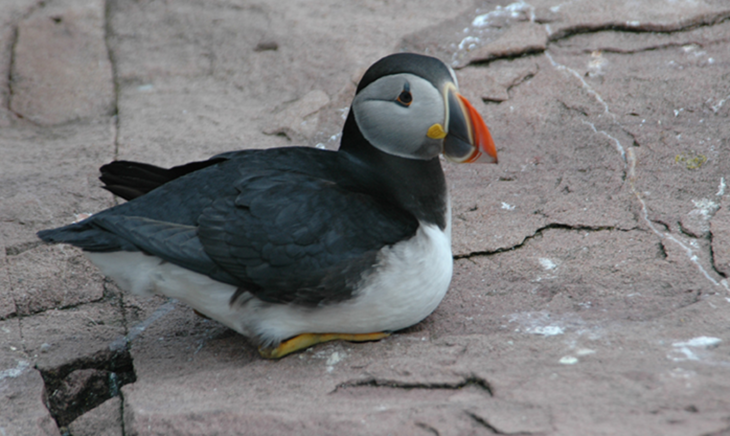 The Puffin – Cutest thing ever! 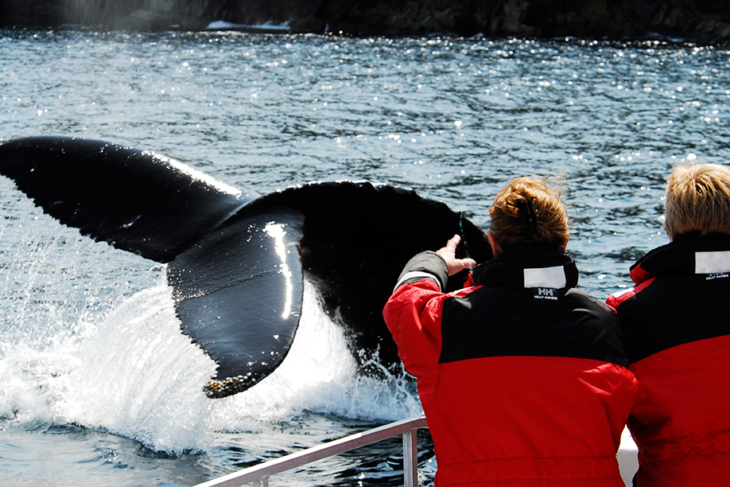 Home of one of the greatest bird sanctuaries on earth, flooded with migrating whales in the summer months, Bay Bulls and Witless Bay, Newfoundland host the greatest whale watching tours in the world. Captain Wayne’s Marine Excursions is one of those tours. A quaint experience that caters to the private gathering for smaller intimate groups. You might not see a whale right away. At first, you’re likely to sputter around the coastline seeing eagles, puffins, intricate caves, cliffs and incredible landscapes. It’s just like a scene out of the Game of Thrones. It’s magical and majestic. It’s wild and free. 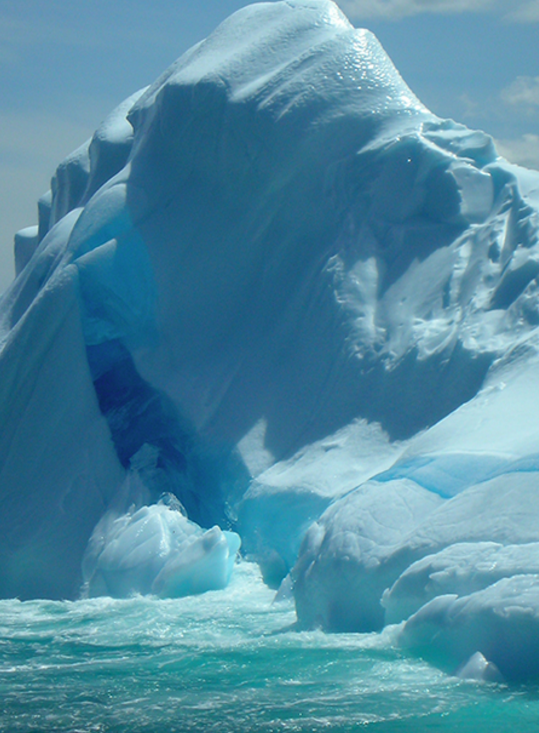 Along the way, you’ll also see waterfalls, icebergs, other seabirds, and wildlife that you don’t get to see anywhere else in the world. You may be out there for half an hour and not even see a whale at first. But the keen eyes of the crew are peeled to the water’s surface looking for “the blow”. Then all of sudden, off the waters horizon they spot that blow. Whale ho – they say and a humungous puff of whales breath and water sprays up into the air as your Humpback comes to the surface after a four-minute dive. Like a little water bomb you hear it first and they you see a powerful spray mushroom up and cascade over the water as it disappears. The people on board stand on their tippy toes just to get closer to see her, for she is the greatest sight on earth. 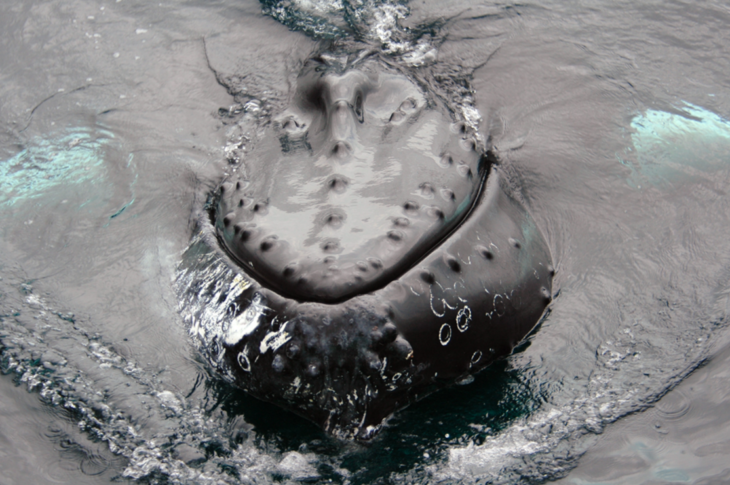 We find our whale travelling along the coastline feeding and diving, feeding, and diving. A single whale, this time, she’s definitely on a mission and food is her top priority. Up close and personal in the midst of the tug and flow of our great adventure waves she surfaces and then flips us a tail as if to say, “look at me, aren’t I grand”. And so she is. Each whale has a different tail print and people come from all over the world to study, track and identify whales in this area. As well drones bring an entirely new perspective in which to view and study whales. It’s become a world class attraction and marine study ground. Well hello handsome. How’s your day? We see three sitings of her this trip. Enough to feel like everything invigorating and magical has just been handed to you on a silver platter by mother nature. Captain Wayne is “pleased to have you aboard”. Captain Wayne and his team take care of your every need from start to finish on this intimate private tour. They equip you with the right jackets, (which have floatation devices in them), give you the best seats in the house and all the while tell you stories and trivia about the local fare. For those who enjoy the adventure, the up close and personal and the breath of the ocean in your face – this is the trip of a lifetime designed just for you. I can’t think of a better way to create synergy with your team, spend the day having fun and build your company team spirit! Or alternatively, just grab the misses and spend a day on the bay! United Arab Emirates – It’s an Adventure!